Room-temperature spin-orbit torque switching induced by a topological insulator | The strongly spin-momentum coupled electronic states in topological insulators (TI) have been extensively pursued to realize efficient magnetic switching. However, previous studies show a large discrepancy of the charge-spin conversion efficiency. Moreover, current-induced magnetic switching with TI can only be observed at cryogenic temperatures. We report spin-orbit torque switching in a TI-ferrimagnet heterostructure with perpendicular magnetic anisotropy at room temperature. The obtained effective spin Hall angle of TI is substantially larger than the previously studied heavy metals. Our results demonstrate robust charge-spin conversion in TI and provide a direct avenue towards applicable TI-based spintronic devices.Published in Phys. Rev. Lett. 119, 077702 (2017). Copyright from APS.Also supported by: NSF DMR-1419807, NSF Grant 1639921, SRC-NRI 2700.001. The strongly spin-momentum coupled electronic states in topological insulators (TI) have been extensively pursued to realize efficient magnetic switching. However, previous studies show a large discrepancy of the charge-spin conversion efficiency. Moreover, current-induced magnetic switching with TI can only be observed at cryogenic temperatures. 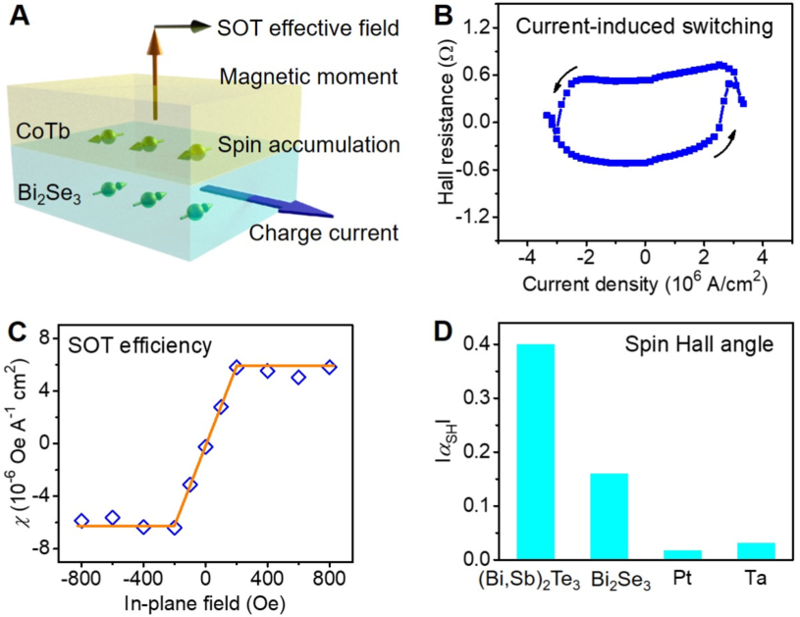 We report spin-orbit torque switching in a TI-ferrimagnet heterostructure with perpendicular magnetic anisotropy at room temperature. The obtained effective spin Hall angle of TI is substantially larger than the previously studied heavy metals. Our results demonstrate robust charge-spin conversion in TI and provide a direct avenue towards applicable TI-based spintronic devices. MBE growth of high quality topological insulator thin films on GaAs substrates. Room-temperature spin-orbit torque switching induced by a topological insulator. (A) Schematic of the spin-orbit torque in Bi2Se3/CoTb heterostructure. The spins injected from Bi2Se3 to CoTb exert a torque onto the magnetic moments, which leads to magnetic switching. (B) Room temperature current-induced magnetic switching in Bi2Se3/CoTb. (C) Spin-orbit torque efficiency as a function of the in-plane magnetic field in Bi2Se3/CoTb. (D) Comparison of the effective spin Hall angles of (Bi,Sb)2Te3, Bi2Se3, Pt, and Ta measured by our experiments. TI shows much larger charge-to-spin conversion efficiency. Han, J., Richardella, A., Siddiqui, S.A., Finley, J., Samarth, N. and Liu, L. (2017) Room-temperature spin-orbit torque switching induced by a topological insulator. Phys. Rev. Lett. 119, 077702.